Without question, the most storied and famous sports venue in America over the past century is the Original Yankee Stadium. Opened in 1923, the Stadium hosted 86 seasons of Yankees baseball, and was home to some of the greatest players of all time in Babe Ruth, Lou Gehrig, Mickey Mantle, Joe DiMaggio and countless others. This icon of Americana saw 26 World Championships, 39 Pennants and countless memories for millions of people. 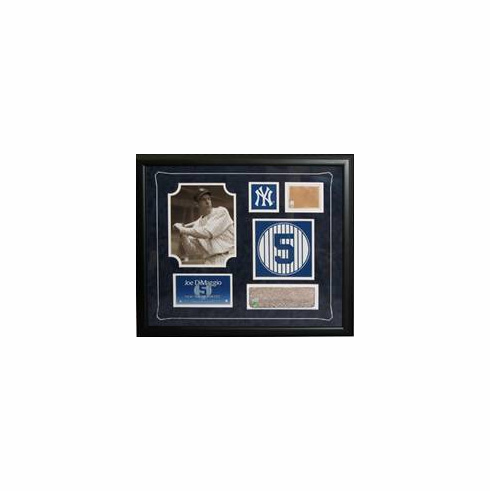 This is fantastic opportunity to take home a piece of historic Monument Park, this collage which features a replication of a Yankee Legend�s retired number from Monument Park, a slice of game used brick from Monument Park, an 8" x 10" of the player, game used dirt from the field and a descriptive nameplate. This is a truly unique piece from the most historic venue in all of sports. A Yankees-Steiner Letter of Authenticity and an MLB Hologram are both included. Available for Babe Ruth, Mickey Mantle, Lou Gehrig and Joe Dimaggio. Each piece is limited to only 26. These large 26.5" x 22.5" framed collages are professionally framed and perfect for your Yankees or baseball room! Very Limited Quantities...Unique Steiner Collectible...we were only able to acquire a handful of these! #4 Lou Gehrig is SOLD OUT.